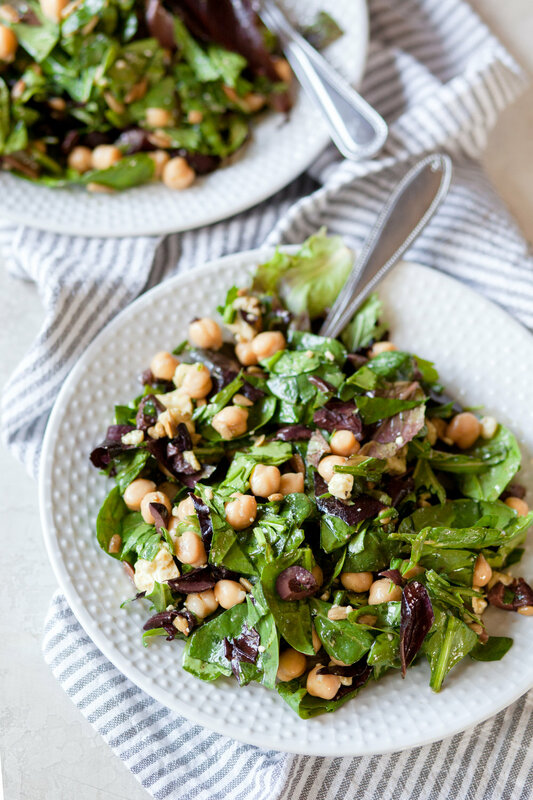 simple garbanzo & gorgonzola mixed green salad. i was noticing that all the recipes on here lately were either tan or brown colored, aka wintry carrrrrrbs, haha. 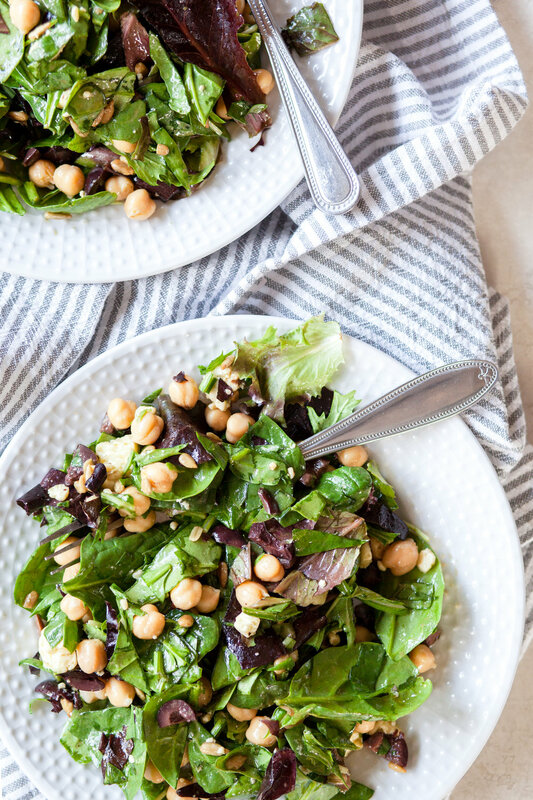 time for a springy fresh mixed green salad, y’all! this one is a copycat mixed green salad from proletariat pizza in white center, seattle. every time pete & i go there with his family, we all pig ouuuut on this salad and want more more more. any salad that makes me wanna pig out on it is definitely one we should all be making at home, riiiiigh? and it’s super easy and non-chop heavy. all the things that go in it just need minimal attention before hitting the salad bowl. 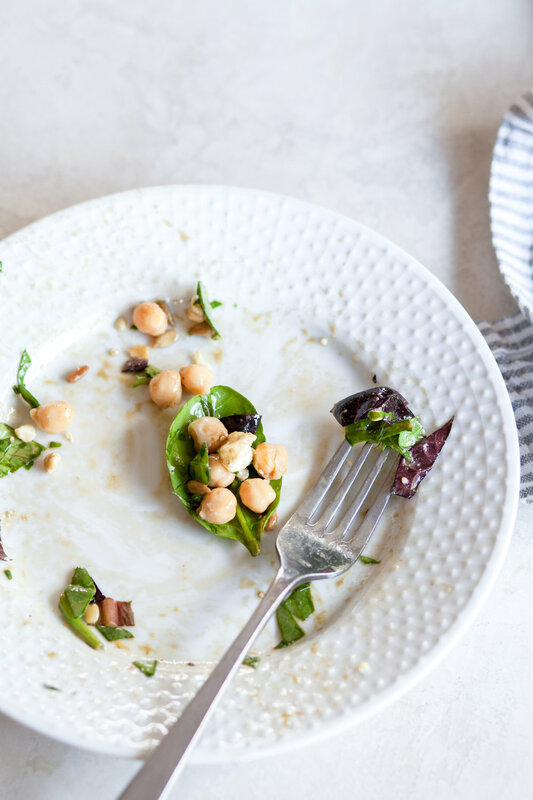 i love how simple this salad is with so much flavor and texture. i added sunflower seeds to my version because i like those little crunchers! i’ve recently been having this one veggie sandwich with sunflower seeds on it, and that is surprisingly guuuud. the dressing is so simple and comes together in 2 seconds to just coat the cool fresh mixed greens with some zingy olive oily goodness. the saltiness of the olives and gorgonzola complement the creaminess of the garbanzo beans and give this an “mmmmmmmm” factor. and sunflower seeds for crunch! i also think avocado would be good on this salad, but i put a whole dang can o ‘banzos here so you can prob skip the avo. or do halvsies of each….oooooooh. so thrilling. In a small bowl, whisk together equal parts extra virgin olive oil and balsamic vinegar, black pepper and a pinch of salt. Roughly chop the spring mix and spinach and place in a large salad bowl. Add the kalamata olives, garbanzo beans, gorgonzola crumbles and sunflower seeds and toss gently with tongs. Add the salad dressing mixture to taste. Serve immediately. ^ inverted spinach leaf becomes a cute lil vehicle for beans and whatnot. lol. 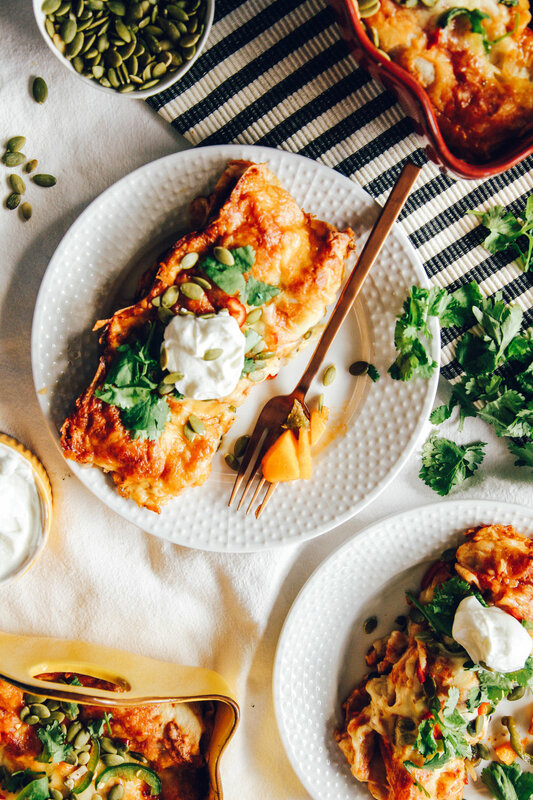 roasted butternut squash & poblano enchiladas. these are some hearty & earthy enchilaaadaaaaas. sometimes when people say something tastes "earthy" i feel like its a neutral way of saying it tastes like dirt. no dirt tastin' here. just yummy butternut squash, roasted poblano pepper, black beans, onion, and cheeeeeeese. lots of flavor and fall feelz. you can use the same method i used in assembling these green & red enchiladas (prob my fave enchiladas to make!). and you can roast the squash & poblano a day in advance. the roasting factor is really what makes you feel like these take forever to make. but they're truly simple once you break all the steps down. so these are yum, get to roastin'! Preheat oven to 450 degrees F. Carefully cut the butternut squash and poblano pepper in half and remove the seeds. Place them on a baking sheet & rub with olive oil. Roast until the squash is tender and the skin of the poblano begins to blacken, about 15-20 minutes. Use tongs to place the poblano pepper in a plastic freezer bag to cool & steam. Peel the skin off the squash, cut it into bite sized cubes and add to a large bowl. Remove the poblano from the ziplock bag and immediately peel off as much skin as possible. Slice the poblano and add to the bowl with the cubed squash. 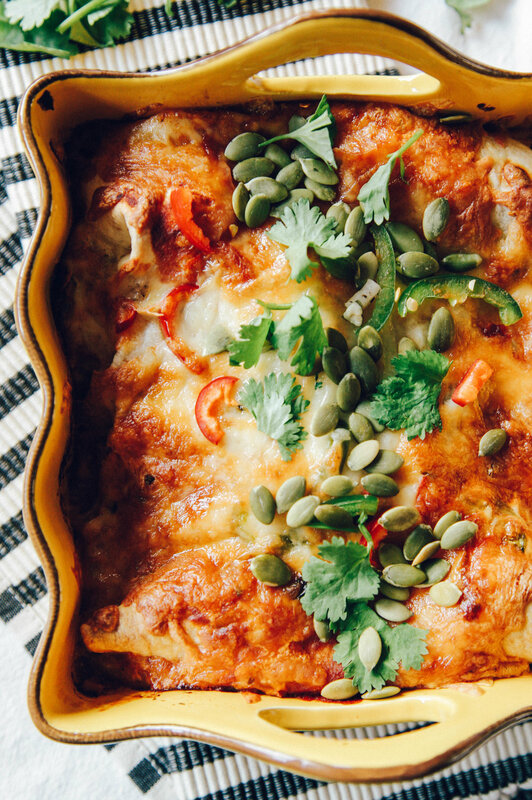 You can roast the squash and poblano a day in advance to save time when putting together the enchiladas. Heat oven to 375 degrees F. Grate the cheeses and chop the onion. Add the black beans and chopped onion to the bowl with the squash and poblano. Add a few good pinches of salt, pepper, and garlic powder to the mixture and stir. Add a light drizzle of enchilada sauce to the bottom of the baking pan. In each tortilla, add a handful of the grated cheeses, a scoop of the squash & poblano mixture, and a light drizzle of enchilada sauce. Roll it up and place seam side down in the baking dish. Repeat until the dish is packed with enchiladas. Drizzle remaining enchilada sauce over the top of the rolled tortillas, a sprinkle of the red chiles or jalapeños, and the remaining cheeses. Bake for 30 minutes, or until the cheese is browned and bubbly. Top with extra red chiles or jalapeño slices, pepitas and cilantro. Serve with plain green yogurt or sour cream. Store in an airtight container in the fridge up to 3 days. Reheat on the stovetop with a touch of olive oil for best results.